It’s that time of the year again, the time of standing in, what seems like, endless queues. There are queues for school and queues for the stores to buy stuff for school and inevitably, these queues always end up with me shelling out a whole lot of money. I have just come back from standing in line for one and a half hours to hand in registration papers for my sixth grader. Ordinarily, that would not be a problem but seeing as that I am going on very little sleep, it was a bit irritating, not to mention the annoying lady who was ahead of me and her son. I think I will just send my other two girls with papers and cheques in hand next week to register themselves. Then after that is the dreaded back to school shopping. I have a whole love-hate relationship with back to school. I love it because, well, heck, it’s back to school! Peace and quiet to do my stuff during the day. I hate it because it means fighting lines for that one red pen everyone needs, or the countless shops I have to go to, just to find adjustable waist pants in size 12. But it doesn’t end right as school starts, it seems like I make a million trips to the store for three weeks after school starts because each teacher has a different sodding request for school supplies. Wait, my spirit of Ramadan is waning…I shall stop complaining and shop for all the supplies with a big, happy, Ramadan smile. The fasting, so far, has been great. The weather miraculously cooled off for us and it’s been quite easy to not eat and drink. The evenings are beautiful and it has been getting quite chilly at night, perfect for the three hours sleep we get! The sleep schedule is the only thing that has been a little off. We get up at 3 am to eat and after praying at sunrise we try and get some sleep. My husband is usually up at 8.00 am to get ready for work. Unfortunately, with the amount of water we are downing between 3 am and 4.30 we are getting up for the loo every stinking hour! I have been trying to sleep in or at least take a nap so I am not so tired when we go to the mosque for night prayer. The children are doing very well! I haven’t heard any complaints about hunger or thirst from them. They don’t go to sleep after we come back from the mosque and stay up eating until it’s time to eat at 3 am! I am very proud of my ten year old, Sahare, she has been doing really well. I had a cauliflower that needed to be used up and half an onion so I mixed them up and fried up these delicious babies. These Ramadan snacks are my weakness and even though I convince myself that I am making them for my children who have been fasting all day, I am really making them for myself! It doesn’t help that my husband is quite partial to them also. 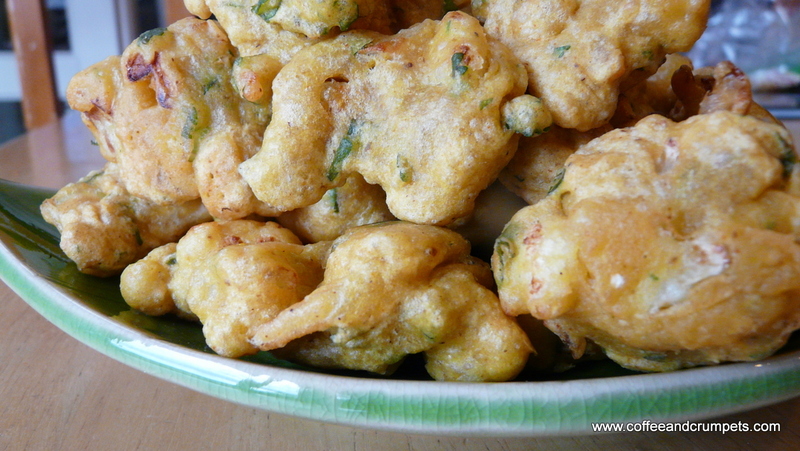 They are dead easy to make and it’s just a matter of chopping up the vegetables and mixing the gram flour into a batter and then frying. Gram flour can be found at Indian stores and will be labelled “Besan.” It’s a flour made from garbanzo beans, also known as chick pea flour. I know you can find garbanzo bean flour in regular super markets (like Bob’s Red Mill) but I have not tried these flours to make any of the fritters before. I always buy besan from the Indian stores. These are delicious served with sweet chilli sauce, ketchup or even a hot sauce. I don’t always make a chutney but that is the usual accompaniment to bhajiyas and samosas. The one head of cauliflower made huge plateful of fritters and we were not able to finish them all, so as far as servings go, I will say this easily serves 8-10 people along with other accompaniments. Place the cauliflower florets into a large bowl and add the turmeric, red chilli powder, garam masala, garlic, ginger, green chilli and the cilantro. Add the the besan flour and mix into a batter using the 2 cups of water first. The batter should be thick and clingy but not lumpy. The batter should coat the florets. If it’s too runny, add a tablespoon of besan at a time to rectify or if its too thick, add tablespoons of water till the right dropping consistency is reached. Check for salt. Heat the oil in a frying pan or skillet. Once the oil is hot (should be shimmering), add small spoonfuls of the batter into the hot oil, very carefully. Some florets will be large enough to just fry separately but some will clump together. Once the fritters are evenly golden brown, remove them onto a paper towel lined plate. Repeat until all the batter is used up. Serve while still hot with some dipping sauces. I hope my Muslim readers are having a great Ramadan and may all your fasts and prayers be answered. For all my non Muslim readers, I hope that you will try making some of these delicious treats we enjoy during our holy month. I hope I have been able to demystify my religion so that you may understand that my faith has always been one of peace and tolerance. In the spirit of this very blessed month, I wish you all peace, prosperity and much happiness. « To Lamb Or Not To Lamb? Thank you for stopping by Aarthi and for your lovely comment! I will most definitely check out your blog. Hope to hear from you again! Who are you fooling??? You’re not going to the store to buy vegetables!! And even if you did, Adnan would stop you at the door! But these were so good…you know I like cauliflower. Potato are next. As always…looks delicious!! Year after year I say I’m going to get some besan. I never did. 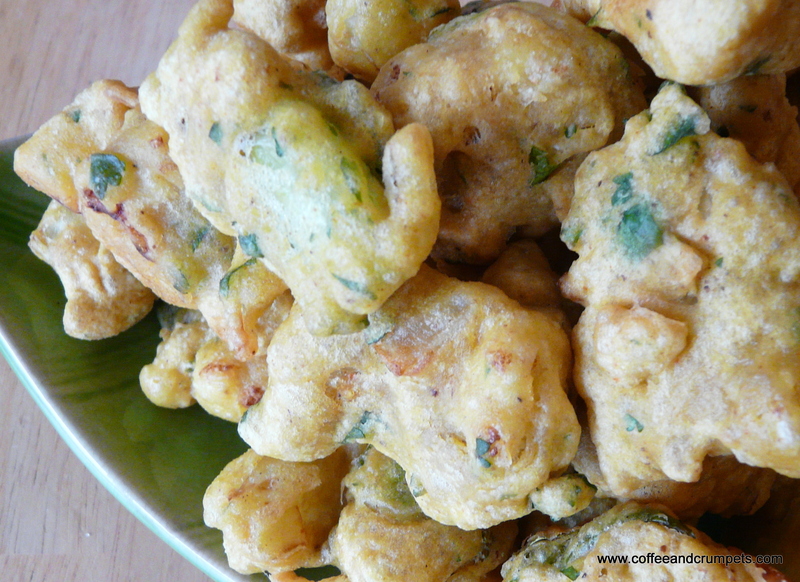 I promise to at least make this and pakoras once this Ramadan. Omar must not like pakoras and the like…that can be the only reason why, especially being married to a Hyderbadi you don’t have besan in your house!